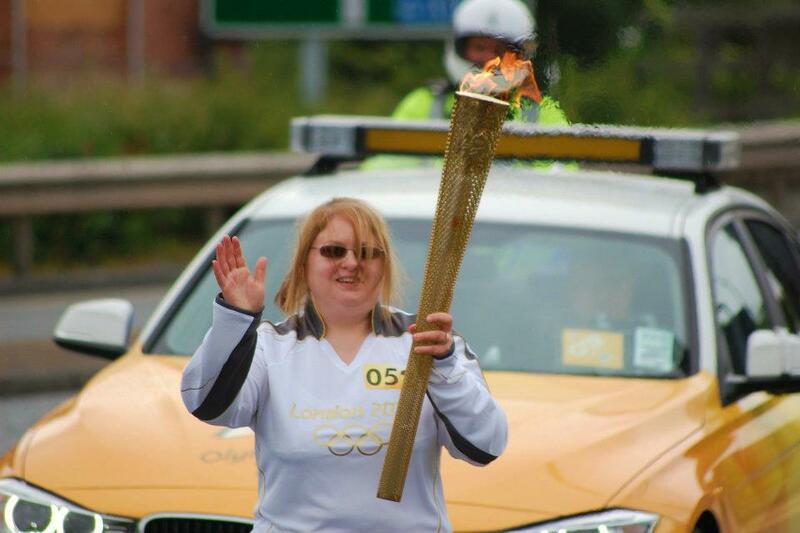 Several months ago I had the honour of being nominated by the RNIB for the work I had done in my role as a Volunteer Campaign Co-ordinator to be a torchbearer for the London 2012 Olympics. I was chosen! Finally the time arrived for the torch relay to reach Sunderland and on 16 June I woke up early and put on by bright white official track suit then made my way to my collection point with my husband by my side for support. I sat nervously waiting for the events to get started. When everyone had finally arrived friends and family members all dispersed to find a place to cheer us on. We were given our debriefing. We got to have a go of holding the torch and were told exactly what was going to happen over the next few exciting hours. After having our picture taken we got on our shuttle bus to take us to our first drop off point. On the bus the excitement began to build and everyone was now rearing to go. As we passed the increasing crowds outside we all waved and smiled overwhelmed with emotion. Our numbers on the bus gradually decreased as one by one we cheered each other off the bus then moved onto the next point. Eventually it was my turn, I felt my nerves and excitement building as i approached the front of the bus and could hear everyone on the bus clap and cheer as I got off. I suddenly felt alone as I was dropped off on a little island in the middle of the road with no one about as the crowds had all gathered further down the road on the pavement. My isolation didn’t last for long as people began coming over wanting to take my picture and asking if their child could have their picture taken with me which made me feel like a character at Disney World. After a few minutes someone on a bike came over to introduce himself and prepare me to take my turn as the previous runner approached. We performed the process referred to as a ‘kiss’ in which they transfer the light from their torch to mine. Before they could usher us apart we did a little country style dance. Now all the attention was on me and the adrenaline set in and all I remember is starting to run and hearing lots of cheering from the crowds around me, some of which were my family and friends who had been waiting patiently for my arrival. Suddenly I was steered towards the next runner and again we performed the ‘kiss’. Before I could be ushered back onto the bus a member of the crowd asked if she could take my picture then the staff whipped me away. It was really like being a celebrity. Back on the bus as we continued the route picking up the rest of our group I began to feel tired and eager to get back to my family and friends but I couldn’t stop waving and smiling to the streets of crowds outside the window; I just wanted to enjoy every second because this really was a once in a lifetime experience. I feel so honoured to have been part of such an historic event, it is something I will never forget. 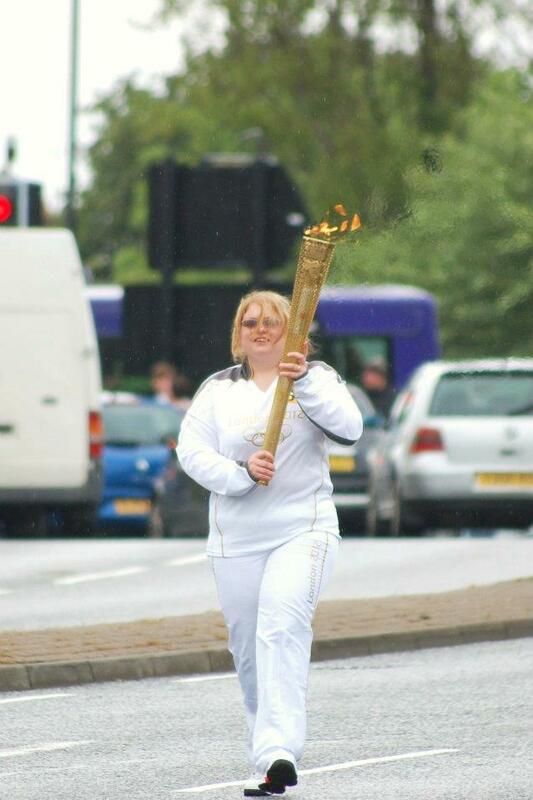 This entry was posted in Patients' tales and tagged london, London 2012, Olympics, torch bearer. Bookmark the permalink.